The Plaza Hotel & Casino will celebrate the grand opening of a special pop-up gallery on Tuesday, November 3 at 7 p.m. featuring the various sports designed products that once decorated the legendary Las Vegas Club Hotel & Casino. 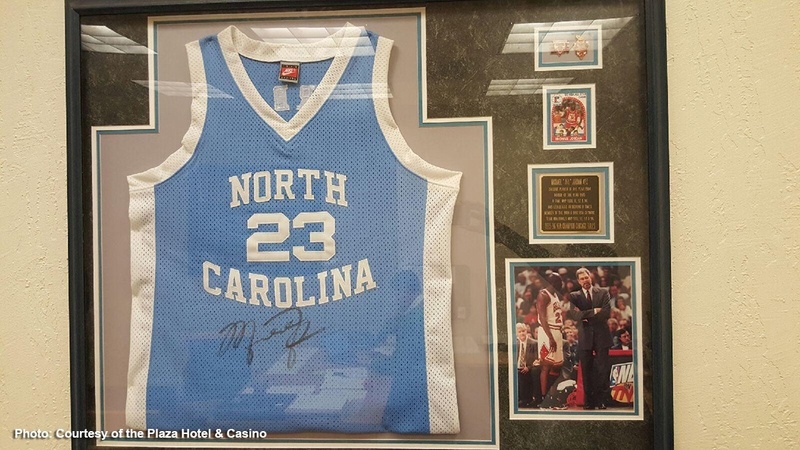 The memorabilia pop-up gallery and store formally opens to the public at 7 p.m., November 3, having a special grand opening event for everyone which includes a drawing to win one of the historic pieces. Hundreds of sports related products are going to be available to the general public to see and buy. The varied collection includes products varying in cost, beginning at $25, and vary by sport. Products incorporate a signed Michael Jordan North Carolina Tar Heels basketball jersey; a framed Pete Rose #14 Montreal Expos jersey, between a photograph from the baseball great as a Philadelphia Phillie and the official Cincinnati Reds baseball card; two official seats from Comiskey Stadium in Chicago; as well as a signed baseball bat collection from the 1946-1958 World Series games. ?For many years, the Las Vegas Club was a sports fan favorite in downtown Las Vegas,? said Jonathan Jossel, CEO of the Plaza Hotel & Casino. ?At the Plaza, we celebrate the history of Las Vegas and wanted to share this vast collection of sports memorabilia with the general public. With the holiday shopping season fast approaching, this pop-up gallery is a great opportunity for those looking for sports memorabilia that also was a unique piece of Las Vegas history.? Beginning November 4, Las Vegas Club Sports Memorabilia Gallery is going to be open from 3 to 11 p.m., 7 days per week. The Plaza Hotel & Casino will donate 10% of each and every purchase within the gallery towards the UNLV Libraries Special Collections that collects unique, historic materials recording the development of Las Vegas, its significant role in gaming and entertainment and as a metropolitan landscape in twenty-first century America.